Le Parfum de la maison is a collection of scented candle bowls, inspired by the 'reveries' of perfumer Céline Ellena. Like a flight of fancy escaping from a folded sheet of paper, Le Parfum de la maison draws us into a waking dream, and communes with every individual's imagination. 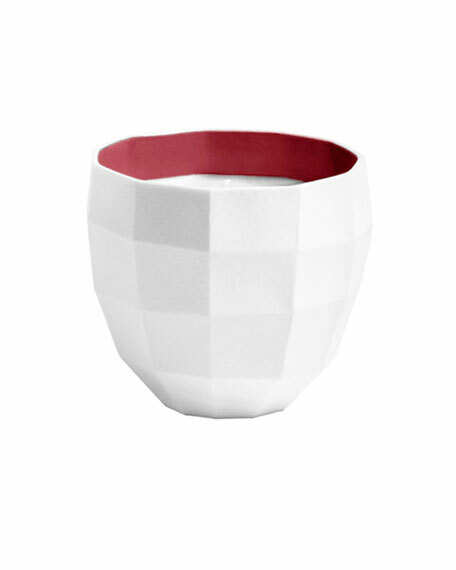 Porcelain scented candle bowl, H Red enameled finish. "A perfume for the home is a smell we listen to, an olfactory murmur that nudges us towards a sense of escape. With this smell, our minds take to the air." Céline Ellena. A shared pleasure in the depth of the night.